A pregnancy of two or more babies is called a multiple pregnancy. Caring for just one newborn is a big job. 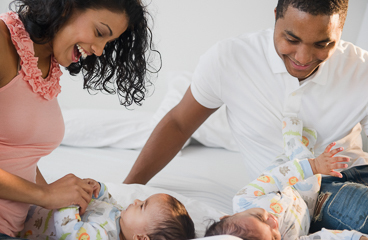 Raising more than one baby means even less sleep, more work, and less time for yourself. From time to time, you may feel frustrated that you cannot keep up with work at home. Do not wait for stress to become a problem before you ask for help. Your family, friends, and doctor can help you find ways to cope. Breastfeeding more than one baby can be challenging, but it helps to build the bond between you and each baby. It can give your babies better health. If you plan to breastfeed your babies, your doctor or lactation consultant can give you good advice. Some women feel sad or depressed after having twins or more. Talk to your doctor if you feel depressed or have troubling thoughts. Follow-up care is a key part of your children's treatment and safety. Be sure to make and go to all appointments, and call your doctor or nurse call line if any of your children is having problems. It's also a good idea to know your children's test results and keep a list of the medicines your children take. You think one of your babies is not eating or growing well. You are feeling so sad or tired that you are having trouble caring for yourself or your children. Enter D174 in the search box to learn more about "Raising Twins or More: Care Instructions".